My wife has cancer and we ordered the essiac tea. I chose to take it along with her for support and figured it could help me to, you never know. I have a few 'liver spots' on my hands that I don't like and after the second week I noticed that the spots had changed. The spots were getting lighter and smaller. It makes senses though, because the tea helps to detox the liver and now a few months later they are barely visible! You really have to know where they are to find them...AND my wife had been doing a lot of alternative treatments and had her tumor removed but it had spread to her lymph system. she was just declared cancer free! I am pretty sure it was a sum of everything she was doing but we believe the tea helped as well. It's been 5 years since my diagnosis and I still drink this tea 3 times a day. I'm cancer-free and I have Essiac Tea to thank! I can't say enough about your product. Not only did it deal with my prostate cancer but last Fall I went to visit a friend who was dying of bladder cancer which had spread throughout his body.He'd been on chemo, etc., all to no avail. I talked him into trying the tea.Six weeks later when I checked in he was cancer free and going to the gym. Need I say more? I'll be back for more.. for use as detox on a regular basis. I thing it helps. Had a problem trinking it at the beginning because I had a strong problem wit nauseas just after the treatment with chemio. Now I have start with 2 to 3 portions a day and still waiting on the positive impact. My aim is 6 a day. I found it a good idea to put "50 $ value" on the parcell because so I hadn't to go ang and get it at the custom like last time. It saved a lot of time. Great!!! Gina I wanted to thank you for your honesty & your follow up on my order. Such honesty & integrity is rarely found these days. I will like & put a review on Facebook. I am not on any other social media, but if there is somewhere else I can leave a review for you please let me know. As I have been using the tea for over 12 years. I have recommended the tea to so many people. I have pieces of paper that I have made & carry them in my purse with your company info on them & I hand them out to people. I was blessed to fine your company..you made it affordable for me to use the tea & I will be forever grateful to you for that. I know you try to help people & you get very high marks from me for that. Thank you again...it is a real pleasure doing business with people like you. Good Quality, speedily shipped, been without bladder cancer repeat for 1 year now. Left for dead with a real “well meaning” oncologist - “ You’ll get no chemo and be lucky if they can get you a feeding tube in, and radiation will be only palliative “” Maybe 30% reduction of tumors in lymph and esophagus from radiation , it is mainly for comfort get your self and affairs in order” Well I’m not dead and don’t feel like I’m dying! We did 18 radiation treatments but missed most because terrible weather polar vortex but drank almost 4 gallons of tea on aggressive plus dose and everything gone. 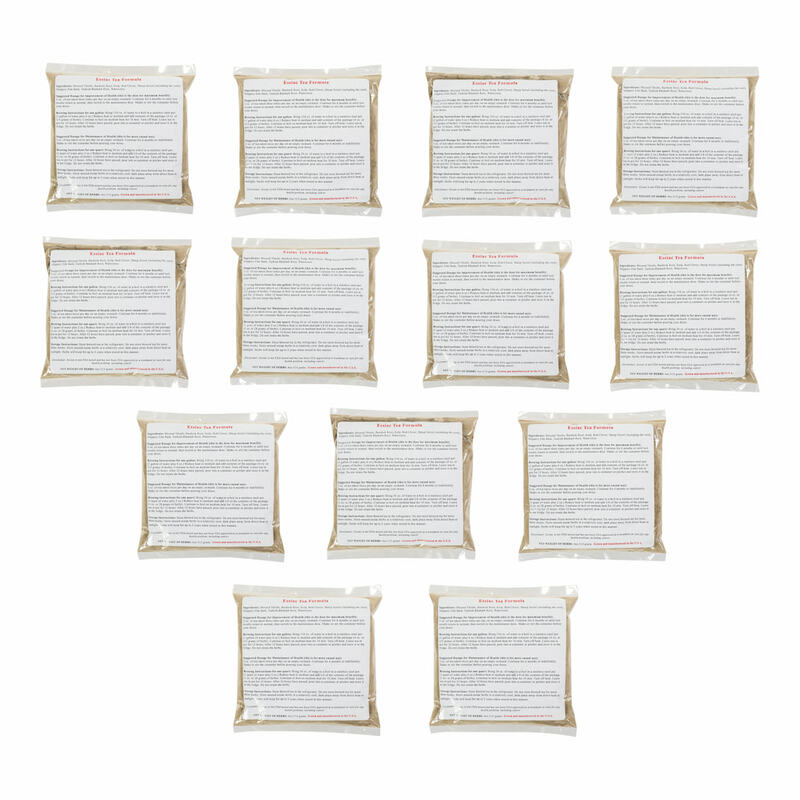 Bryan sent the first life saving package of tea Gratis and we were days from death. It was the most incredible thing it was Heaven sent. Thank you Bryan and Gina ???????? Aheeyeh Asher Aheeyeh ! 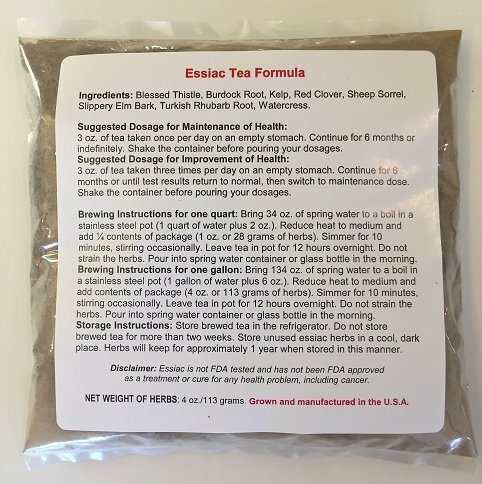 I have been using the Essiac tea for several years. I had breast cancer and chose to have a lumpectomy done. I know that drinking the tea has helped me to stay well. I never get sick, and I am so thankful for that. My wife and I both use your essiac as a 'preventative' measure and appreciate the health benefits from a very high quality product. Thankyou for providing such a vital wellness tea. I have been buying from this seller for many years. Best price, best quality. Heard about this product from a client who had undeniable positive results. He did PLENTY of research too.